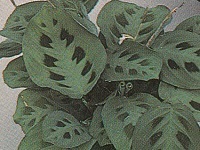 Prayer plant (Maranta leuconeura) is a perennial with wide oval shaped green leaves that have bright, symmetrical designs running down the spine of each leaf. The plant is native to the tropical rain forest of Brazil. It grows to about ten (10) inches tall and the leaves are approximately six (6) inches long and four (4) inches wide. This exotic plant is named for its unique habit of raising its horizontal leaves in an upright vertical position at night time. The leaves then fold together like hands during prayer! The plant is also known as the Ten-Commandments Plant, Red-veined Prayer Plant, and the Rabbits Foot Plant. 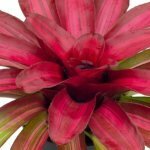 For decorative purposes, the plant looks great on coffee tables, in hanging baskets, and large terrariums. When grown under ideal conditions, the plant may develop small white flowers. Lighting: Moderate light. Direct sunlight can scorch the leaves and quickly kill the plant. Turn regularly so that all sides receive equal light for symmetrical growth. Watering: Water thoroughly and drain. Keep soil evenly moist at all times, but never let the soil get soggy. During the winter months, you can let the topsoil dry between waterings. Always use room-temperature water. Periodically leach soil to remove salt, which can burn your plant. Chlorine found in tap water can cause the leaf tips to turn brown. Use filtered water or let water sit for 24 hours before watering the plant. This allows the chlorine to evaporate. Humidity: Moderate to high. You can raise the relative humidity by a daily misting with tepid water. You can also set a pebble tray, the evaporating water will give the plant some added humidity. Temperature: 75-85 degrees for days. 65 degrees at night or a little cooler. Fertilization: Feed every two weeks during the growing season, which is from spring through fall. Use a high quality water soluble plant food. Soil: Always use a good quality all purpose potting soil that drains well. You can add some Perlite or sand and a little peat for good drainage. Potting Mix Recipe: To mix your own soil use 1 part Perlite or coarse sand, 1 part garden soil and 1 part peat or humus dusted with just a little bit of lime. Rocks can be used to help with drainage and you should use a pot that has a hole in the bottom. Propagation: Propagation can be done by plant division or cuttings in early in the spring at the time repotting should be done. Repotting: Repot each year in early spring with a standard potting soil. Use a pot that is one size larger. 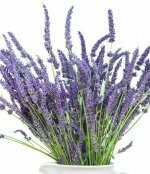 Pests: Plant may be attacked by mealybugs and spider mites. Mealybugs appear as clusters of white cottony masses on the undersides of leaves, on stems, and leaf joints. Spider mites show signs of webbing over flower buds and between the leaves. The prayer plant will die back during the winter but will start new growth in the spring.